Square shower drain system supplied by us is a complete wet room solution. They have included proper top cover and plastic adjustable waste siphon trap. There are multiple grate designs and sizes: 100 x 100 mm, 120 x 120 mm 150 x 150 mm 122 x 122 mm. They are suitable for concrete and wooden floors, and are designed to be installed in tiled floor finish. Every necessary part is included, making fitting fast and easy. There's a waste trap with UK standard pipe size as well as hair catcher for shower to prevent small objects as rings from being drained. is the largest square shower drain for wet rooms in our shop. It has included stainless steel flange and sealing membrane, which are very useful where waterproof seal is necessary. It is made of 304 grade stainless steel which gives product seamless solid look and strength to resist corrosion. It consits of 150 x 150 mm drain frame and 144 x 144 mm grate. Zonda grating is patterned with angled rectangles over the entire cover surface, ends of them are rounded and they allow water to flow. Stainless steel is finished with brush, which is very practical and long lasting solution, even after scratching it damage will usually not be visible. is the smallest wet room gully. It's suitable only for outdoor use and should not be installed in wet areas. It doesn't have stainless steel flange so it would require a lot of work to make it waterproof. It is made of 304 grade stainless steel which gives product seamless solid look and strength to resist corrosion. It consits of 100 x 100 mm drain frame and 94 x 94 mm grate. Total channel depth is 30 mm, so gives some flexibility when cast into concrete. Zonda grating is patterned with angled rectangles over the entire cover surface, ends of them are rounded and they allow water to flow. Stainless steel is finished with brush, which is very practical and long lasting solution, even after scratching it damage will usually not be visible. Square shower drain Wiper Top Mistral cover and frame is made of stainless steel and waste pipe and plastic non-return valve McAlpine siphon trap and pipe. Dedicated non-vowen fabric sealing membrane and stainless steel collar with screws is included, for easier installation. Total height of the drain is 143 mm. It can be cut to decrease size and minimum height is 97 mm. Mistral top cover has regularly placed differently sized circular holes, which are used for water to flow. Insulating flange radius is 100 mm. Stainless steel is finished with brush, which is very practical and long lasting solution, even after scratching it damage will usually not be visible. McAlpine siphon trap comes with the drain. It is dry trap, which means that it will stop the smells from returning back to shower even after water evaporates. It's capacity is 32 l / min which is more than enough for standard bathroom which requires only 24 l /min. Siphon outlet can be connected to 40 and 50 mm waste pipes. is the smallest wet room gully. It has included stainless steel flange and sealing membrane, which are very useful where waterproof seal is necessary. It is made of 304 grade stainless steel which gives product seamless solid look and strength to resist corrosion. It consits of 100 x 100 mm drain frame and 94 x 94 mm grate. Mistral top cover has regularly placed differently sized circular holes, which are used for water to flow. Stainless steel is finished with brush, which is very practical and long lasting solution, even after scratching it damage will usually not be visible. It consits of 120 x 120 mm drain frame and 114 x 114 mm grate. Mistral top cover has regularly placed differently sized circular holes, which are used for water to flow. Stainless steel is finished with brush, which is very practical and long lasting solution, even after scratching it damage will usually not be visible. It consits of 150 x 150 mm drain frame and 144 x 144 mm grate. Mistral top cover has regularly placed differently sized circular holes, which are used for water to flow. Stainless steel is finished with brush, which is very practical and long lasting solution, even after scratching it damage will usually not be visible. It consits of 100 x 100 mm drain frame and 94 x 94 mm grate. Total channel depth is 30 mm, so gives some flexibility when cast into concrete. Mistral top cover has regularly placed differently sized circular holes, which are used for water to flow. Stainless steel is finished with brush, which is very practical and long lasting solution, even after scratching it damage will usually not be visible. Square shower drain Wiper Top Tivano cover and frame is made of stainless steel and waste pipe and plastic non-return valve McAlpine siphon trap and pipe. Dedicated non-vowen fabric sealing membrane and stainless steel collar with screws is included, for easier installation. Total height of the drain is 143 mm. It can be cut to decrease size and minimum height is 97 mm. 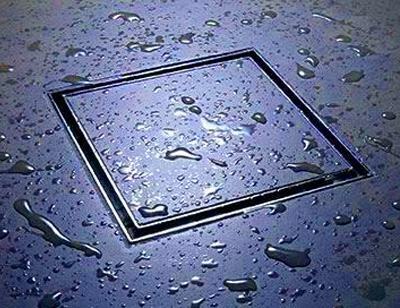 Square drain comes with Tivano cover, which has a pattern of 4 L shaped rectangles and small square between them. Insulating flange radius is 100 mm. Stainless steel is finished with brush, which is very practical and long lasting solution, even after scratching it damage will usually not be visible. Sufficient McAlpine siphon trap comes with the drain. It is dry trap, which means that it will stop the smells from returning back to shower even after water evaporates. Flow rate of 32 l / min is more than enough for standard wet room which requires only 24 l /min. Siphon outlet can be connected to 40 and 50 mm waste pipes. It consits of 100 x 100 mm drain frame and 94 x 94 mm grate. Square wet room drain comes with Tivano cover, which has a pattern of 4 L shaped rectangles and small square between them. Stainless steel is finished with brush, which is very practical and long lasting solution, even after scratching it damage will usually not be visible. It consits of 120 x 120 mm drain frame and 114 x 114 mm grate. Square wet room drain comes with Tivano cover, which has a pattern of 4 L shaped rectangles and small square between them. Stainless steel is finished with brush, which is very practical and long lasting solution, even after scratching it damage will usually not be visible. It consits of 150 x 150 mm drain frame and 144 x 144 mm grate. Square wet room drain comes with Tivano cover, which has a pattern of 4 L shaped rectangles and small square between them. Stainless steel is finished with brush, which is very practical and long lasting solution, even after scratching it damage will usually not be visible. It consits of 100 x 100 mm drain frame and 94 x 94 mm grate. Total channel depth is 30 mm, so gives some flexibility when cast into concrete. Square drain comes with Tivano cover, which has a pattern of 4 L shaped rectangles and small square between them. Stainless steel is finished with brush, which is very practical and long lasting solution, even after scratching it damage will usually not be visible. Chat started. Session ID: 1556251481. You are now connected to: David M.